Captain George Calvert Yount (1794-1865), born in North Carolina, is said to have discovered an outcropping of gold-bearing quartz on Santa Catalina Island in Cherry Valley in the 1830s, twelve years prior to the 1850 California gold rush. He was an otter hunter who returned to the island many times until 1854. Samuel Prentiss was his friend and associate. 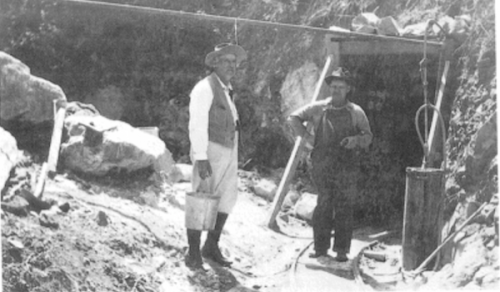 Before the Gold Rush in 1848, there were rumors that gold had been discovered on Catalina. A similar discovery on the mainland in the San Fernando area also pre-dated the gold rush. As the gold fields in the north came under prized ownership, enterprising individuals began to search for gold elsewhere. Catalina was one location drawing fortune-hunting miners. Although gold and silver were discovered on the Island, only small amounts were found in some island canyons, thus a Catalina Island gold boom never materialized. This page was last edited on 15 January 2019, at 12:20.